Bumblebees readily pollinate tomatoes. 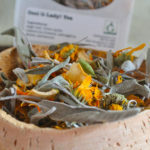 Attract them with herbs, flowers & water. Looking for the best tomatoes to grow? 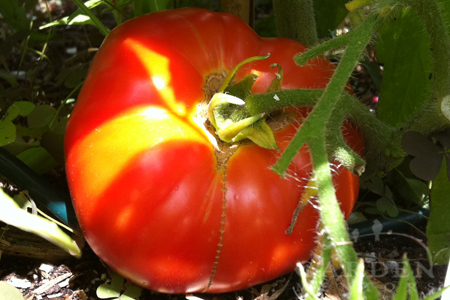 If you’re in the Pacific Northwest, consider our short list of great tomatoes to grow. We’ve included some sugary cherries, succulent slicers, all-purpose all-stars, container performers and pastes with aplomb. Red, ripe & meaty paste tomatoes are ideal for cooking & preserving. These are what we believe to be the best tomatoes to grow in the Pacific Northwest, based on years of growing many types of tomato in the cool, short Seattle growing season. Let us help you take the guess-work out choosing which tomatoes to attempt! Cherries: If you don’t have much time or experience growing tomatoes, cherries may be your best bet for your first foray. The fruits are tiny and ripen fast, so success if fairly simple. That being said, the variety you choose can make a difference. In our experience, pear shaped cherries tend to split a lot, which means lots of yucky fruit. We’ve tried the heirloom ‘Black Cherry’ and found it fairly flavorless and more likely to put on a lot of green growth and not many ripe fruits. So, maybe skip those. Cherry tomatoes are prolific fruiters that ripen fast & are sweet like summer. Instead, the perennial favorite ‘Sungold’ is hands-down our favorite cherry for performance and flavor. This indeterminant variety may put on a lot of green growth, but that is equally matched with abundant, candy-like fruits throughout the season, and those fruits aren’t likely to do much cracking. If you prefer to grow a cherry tomato in a container, consider the semi-determinant ‘Gold Nugget,’ which isn’t quite as sweet as orange-yellow ‘Sungold’ but it produces very well both in the ground and in a pot. Growing more cherry tomatoes than you know what to do with? Don’t let those cherry tomatoes drop and rot on the ground. Even if you can’t eat all of them fresh, it’s incredibly easy to freeze them to use in soups, stews and braises come winter. 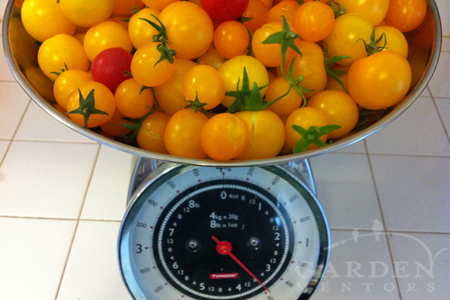 Learn how easy it is to preserve your cherry tomato bumper crop! Slicers: Growing big, fat slicers that actually ripen in Seattle can be tough, especially if you are picking varieties that weren’t developed for our often cool and wet summers. Fortunately, there are several slicing tomato cultivars that actually do turn red and taste great in the Pacific Northwest. Skip the generic ‘Beefsteak’ and dull ‘Early Girl.’ Instead look for star performers like ‘Siberia, ‘Legend,’ ‘Peron’ and ‘Oregon Springs.’ These produce large, tasty orbs that ripen even in a short, cool growing season. In fact, that’s exactly what they’ve been bred to do. Following our month-by-month care guide may help as well. And, don’t be lured in by readily available ‘Stupice.’ This variety does perform well, but in our experience, the fruits aren’t very tasty, and they really don’t get very big. Think: jumbo cherry without the sweetness. Consider this one more of a salad tomato, at best. When you choose the right tomato variety for your climate & care for your plants, big, juicy slicers like these are possible. Another Tip: If you aren’t growing your tomatoes from seed, pick up starts from a local grower or nursery that supplies locally-grown starts. If the plant was cultivated in, say, SoCal, it may not be right for your NW garden. 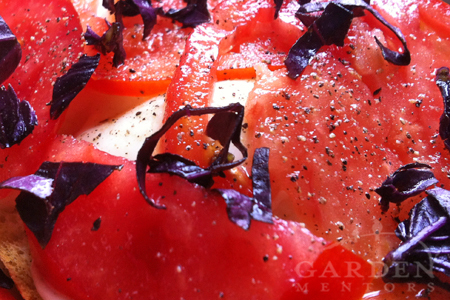 There’s nothing quite as delicious as a garden-fresh tomato with freshly picked basil. Container Tomatoes: A few years ago Renee’s Garden Seeds sent us some free trial seeds for the variety ‘Super Bush.’ We grew these in containers, assuming they would produce cherry sized fruit. Instead, we were rewarded with hardy, productive, plants that were content to be crammed in a pot with flowers. Each plant produced abundant clusters of big(ish) tomatoes with loads of flavor and delicate (but not cracking) skin. These aren’t quite beefsteak sized slicers, but they’re bigger than a small salad tomato like ‘Stupice.’ And, to reiterate from the cherry section above: ‘Gold Nugget’ is a great option for containers. Stay tuned this season: We’re trying a new trial container cherry tomato ‘Litt’l Bites’ courtesy of Renee’s Garden Seeds. So far the few seeds that germinated are plugging along nicely in our greenhouse. We’ll know more as the season progresses. All Purpose All-stars: How awesome would it be to grow a tomato that works great fresh off the vine on a sandwich or in a salad but also produces fruit that juices, freezes, cans and dries equally well? 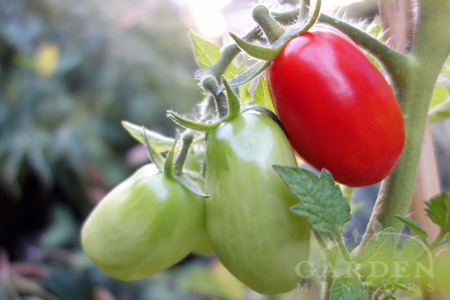 Try a selection of tomato plants to find the right ones for your taste buds & garden. A couple of years ago we seeded ‘Gill’s All Purpose’ tomato to see if it really is an all purpose wonder fruit. Indeed it is, and the fruits are delicious. Plus, the plants are large determinants, so they get big and offer lots of fruit without spreading all over the place and never ripening. They have just enough juice, tangy-sweet flavor and not too many seeds. Since that first year growing them, we’ve kept them in rotation. Want fresh tomatoes in winter? If you’re looking for an all purpose tomato that you can keep fresh in your cellar to slice into salads come winter, don’t miss our review of ‘Long Keeper.’ If you want to grow a tomato indoors in winter, ‘Red Robin’ might be for you; here’s why. 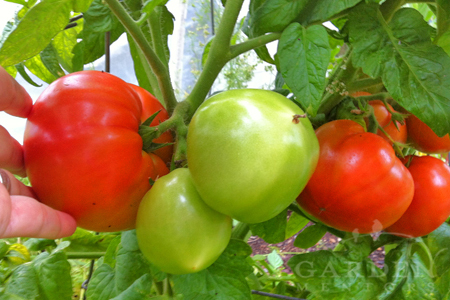 One of the best tomatoes to grow: ‘Oregon Springs.” The name says it all! Pastes with Aplomb: Paste tomatoes get more of our limited growing space than other varieties these days. This is because they are important in our kitchen. We’ve made paste with them in the past, but more than anything, we appreciate how wonderful they are to dry. And, with a handful of dried tomatoes, we have more cooking options than a glob of paste provides. Our favorite paste tomato varieties are ‘Saucy Paste’ and ‘San Marzano.’ The former produces prolific numbers of tomatoes that have decent flavor; the later is famed for its flavor but may need a little more TLC for an abundant crop. 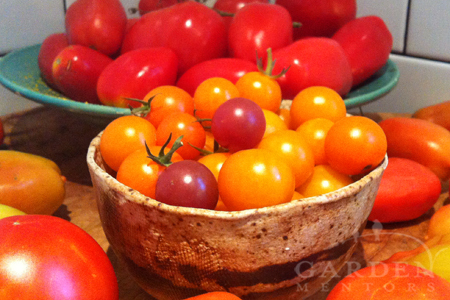 Both are worth the effort so you can bust out your dehydrator to put by your tomato harvest for many meals ahead. Having Blossom End Rot problems with your tomatoes? 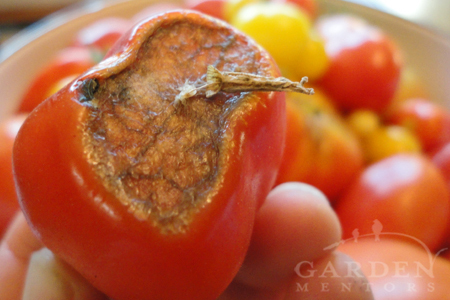 Paste tomatoes seem to have a strong tendency to get blossom end rot, but that’s manageable. And, frankly, it seems like the first tomato or two to ripen on a paste vine get the problem and then it pretty much goes away. Still, if any of your tomato fruits are suffering from end rot, here’s how we manage blossom end rot challenges. Blossom end rot is a bummer, but it’s possible to avoid & easily turn around on your plants. Once you’ve started growing any tomato variety and need help getting your crop to thrive, check our month-by-month tomato growing tips and our pictorial guide to removing tomato suckers. And, there’s much more on getting the best from your tomatoes in our extensive tomato blog archive. Hi I feel compelled to plead Black Cherry’s case – please try it again – several years running it has been one of my favorites, and I’ve grown over 20-60 varieties yearly for the last three years. Not as productive as Sungold, but packed with unforgettable flavor. Thanks for your comment Erica. Glad Black Cherry has found a fan in you.